Can you believe that September is halfway over already? My son has been doing great in his new school and been reading up a storm. They have an incentive program for reading. It’s read so many books, and you get to go on the field trips. Don’t read and no field trip for you. So he’s had his head in a book almost everyday. It’s fantastic! My daughter just turned 3 months old. She’s trying her best to sit up and is already grabbing for food off our plates. She loves the smell of foods and always perks up when she hears dishes making noise in the kitchen. Even though she’s so enthusiastic for food, I want to wait until she’s at least 4 months before we try introducing baby foods. I’ve been getting in a better morning routine with the kids. The baby needs to nurse at least twice before we leave to drop off my son at school, and I need to make lunches and breakfast for everyone. And to make it interesting, I’m continually trying to think of new quick and easy recipes that everyone will love. So this past week I tried making our favorite Thomas English muffins into French Toast. Now French toast is one of my favorite breakfast items. My Dad use to make it a lot and it brings back great memories. It’s so simple and easy to make and you can put your own personal or seasonal spin on it like I did here. Since my family loves pears, I made this French Toast with fresh pears that I sautéed with brown sugar and butter. They make a wonderful addition to French toast, especially when served with warmed Maple syrup. And what better way to celebrate the end of summer and approaching Fall season than by enjoying delicious pears. You can use any flavor of English muffin for this recipe, but I used Thomas’ Breads new Pumpkin Spice English muffins. And let me tell you they are beyond amazing. Even if you think you’re all pumpkin pie spiced out, you have to try these. Even my husband who could care less if he ever see’s another pumpkin, couldn’t get enough of these. They are so good! Heat skillet over medium heat. Combine eggs, milk or cream, pumpkin pie spice and salt in a large bowl. Whisk well. Drizzle skillet with olive oil. Dip English muffins in egg mixture and place in skillet. Cook until golden brown on each side, about 2 minutes per side. 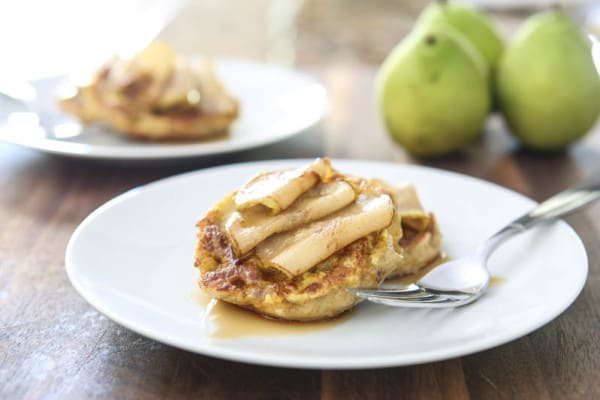 When English muffins are done, turn heat to medium-low and add butter and pears to skillet. Cook until pears are tender crisp and then add brown sugar. Continue to cook until pears are lightly browned and softened. 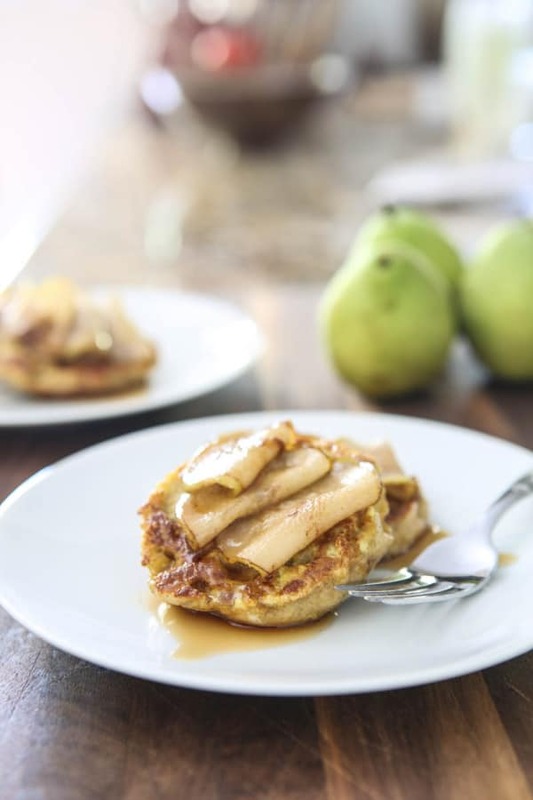 Serve sliced pears over English Muffin French Toast. Serve with warmed maple syrup. Oh, English Muffin french toast is a great idea! I just love the beautiful fall flavors in this breakfast. French Toast is one of my favorite breakfasts. It sounds as though you’re falling into a good morning routine – always challenging when a newborn comes into the mix! I love the idea of this French toast. It would be a great things to mix things up for my family in the morning. Nursing a baby and another in school and blogging, you are a busy momma and still found time to send him off with a yummy breakfast, kudos to you! I remember those busy school day mornings so well! Great job getting a delicious, homemade breakfast ready on week day. I haven’t tried the new pumpkin spice English muffins, but I’ll be looking for them on my next shopping trip! Look at you doing all of this with a newborn baby! I don’t think the morning rush ever goes away, even as they get older, because it is so rushed here still! Great breakfast idea, Angie! What a cool reading program! I remember when Pizza Hut had a reading incentive program when I was in elementary school. That was genius. 😀 And this looks so delicious! And different. I’ve never had anything like it but I’d like to try! You’re so creative – I could barely puree vegetables for my baby! 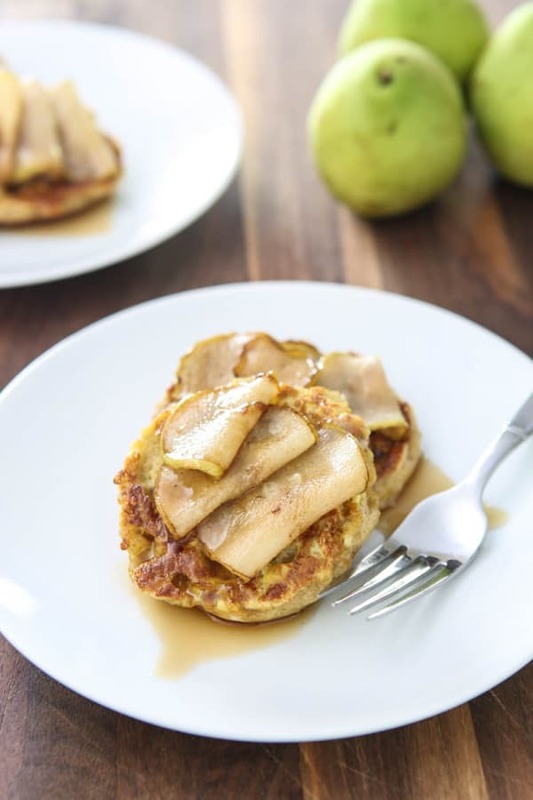 The pear-pumpkin combination sounds delicious and so perfect for fall!